Weekend Wrap: Netflix launches HDR content, Ruark Audio R7 MKII, new Crosley turntable | What Hi-Fi? From the news that Ruark Audio has launched a new version of its R7 radiogram, to Netflix rolling out HDR content and a new Crosley turntable, it's What Hi-Fi? 's Weekend Wrap. Netflix has confirmed it has begun streaming HDR content, but at the moment only Sony Android 4K TVs are compatible. 2015 models, including the X85C, S85C, X90C, X93C and X94C are all in line for an update, as well as some 2016 ranges including SD85, XD85, XD93 and XD94. 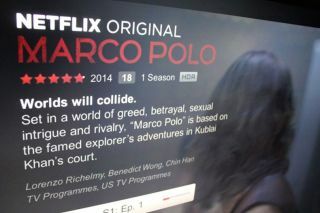 Marco Polo is the first Netflix show to be streamed in HDR, with Netflix dropping the Ultra HD 4K labeling on compatible shows in favour of a single HDR badge. It's claimed that compatible Sony TVs will automatically switch to its default HDR setting when a show is selected, and will switch back when you exit an HDR show. Speaking to Inside CI, a Netflix spokesperson said the streaming service would deliver Dolby Vision and HDR10 streams to any compatible TVs in any of the 190 territories that Netflix is available, so updates for other TVs are expected soon. As with its 4K content, you'll need to pay extra to access the Netflix HDR shows - it's £8.99/month to watch 4K HDR content on up to four screens simultaneously. Netflix has also confirmed it will be increasing the price of its full HD subscription to £7.49/month later this month. Ruark Audio has updated the R7 radiogram, which it first released in 2013. The new model has upgraded linear amplifiers and changes to the crossovers, which Ruark says results in better sonic integration. The R7 MK II supports a variety of sources, including CD, aptX Bluetooth, DLNA wi-fi and FM/DAB/DAB+ radio, while inputs comprise two analogue, one optical and one coaxial. The R7 MK II is available now for £2000. We may not be fans of the Crosley Cruiser's sound quality but there's no denying the company knows how to make a nicely put together piece of equipment. The new Crosley Bermuda Dansette Turntable is the latest example, a 'furniture-style statement' turntable system complete with integrated speakers. And it has legs. Detachable legs. The Bermuda Dansette has a belt-driven deck, allows you to digitise your vinyl thanks to a USB connection, and there's an auxiliary input for connecting other music players. It's on sale now for £230. Netflix is set to release its first UK show on 4th November. The Crown comes from Peter Morgan, whose other works include The Queen and Frost/Nixon, and stars Claire Foy and Matt Smith of Doctor Who fame. The show will focus on the reign of Queen Elizabeth II, with the first season reportedly costing $156m to produce - the most expensive Netflix original series to date. Speaking of West, his album The Life of Pablo has made US album chart history after it shot to the top of the Billboard 200 chart based on streaming figures alone. Nielsen Music has said the number of album streams is the equivalent of 66,000 album purchases - the Billboard 200 counts 1500 streams as one album sale. The album sold another 28,000 copies on Kanye’s website for $20 a piece. Pioneer has now released an update for its XDP-100R portable hi-res audio player, allowing it to now support MQA files. The update means the Pioneer player is the first portable player in the world to support the new music file format. MQA is a way of deliver hi-res audio but in a smaller file size, without compromising on quality. When listening to MQA files on the 100R, it will display on the screen and have a green or blue light. The green light means the file is identical to that of the source material while a blue light means the stream has been approved by the artist/producer or verified by the copyright owner. Bob Stuart, MQA’s creator, commented on the Pioneer launch. “We are very excited to launch MQA on the Pioneer “XDP-100R”. Throughout the implementation process the MQA listening tests have been astounding and we’re looking forward to hearing customers reactions to MQA on the portable player."